Why is the United States the only advanced capitalist country with no labor party? This question is one of the great enduring puzzles of American political development, and it lies at the heart of a fundamental debate about the nature of American society. Tackling this debate head-on, Robin Archer puts forward a new explanation for why there is no American labor party-an explanation that suggests that much of the conventional wisdom about "American exceptionalism" is untenable. Conventional explanations rely on comparison with Europe. Archer challenges these explanations by comparing the United States with its most similar New World counterpart-Australia. This comparison is particularly revealing, not only because the United States and Australia share many fundamental historical, political, and social characteristics, but also because Australian unions established a labor party in the late nineteenth century, just when American unions, against a common backdrop of industrial defeat and depression, came closest to doing something similar. Archer examines each of the factors that could help explain the American outcome, and his systematic comparison yields unexpected conclusions. He argues that prosperity, democracy, liberalism, and racial hostility often promoted the very changes they are said to have obstructed. And he shows that it was not these characteristics that left the United States without a labor party, but, rather, the powerful impact of repression, religion, and political sectarianism. 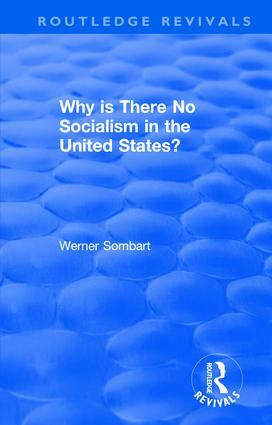 Werner Sombart was a German economist and sociologist, the head of the Youngest Historical School� and one of the leading Continental European social scientists during the first quarter of the 20th century.